Pool vacation from February to mid-November and Christmas holidays ! 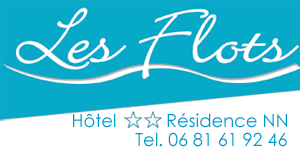 Welcome to the Hotel Residence Les Flots in Saint-Palais-sur-Mer. You will spend there a most pleasant stay throughout the year. 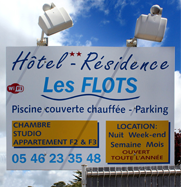 The Hotel Residence Les Flots is an apartment hotel, self-catering-accommodation, ideally situated in Saint-Palais-sur-Mer less than fifteen minutes from Royan. Whether you rent accommodation for one night, one weekend, a week or a month, you always be welcome in a friendly and family atmosphere. Ideally located in Saint-Palais-sur-Mer, near downtown, shops, beaches. Do not hesitate to contact us now for more information and reservations.